The high-tech grandeur of aviation had an enormous appeal for the Soviet citizens. Sluggish blimps were condemned after a series of catastrophes, and rapid development of fast airplanes became top priority. 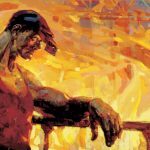 Among the cultural idols of pre-war Russia were the aviator, Valery Chkalov, and the navigator and pilot, Marina Raskova—the first woman employed by the Soviet Air Force. As all pilot celebrities of the 1930s, Marina made several long-distance record-breaking flights, setting an international women’s record in 1938 when she and her crew of two female pilots flew from Moscow to Komsomolsk in the Far East on an Ant-37. Soviet pilots’ valor and their superb flying skills were put to a severe test during WWII. In the first two days of the invasion, German fighters and bombers destroyed 2,500 Soviet aircraft. After the aircraft factories were evacuated to the Ural Mountains, the country produced 1,000 planes a month. Valentina Grizodubova. Non-stop record flight from Moscow to the Far East. 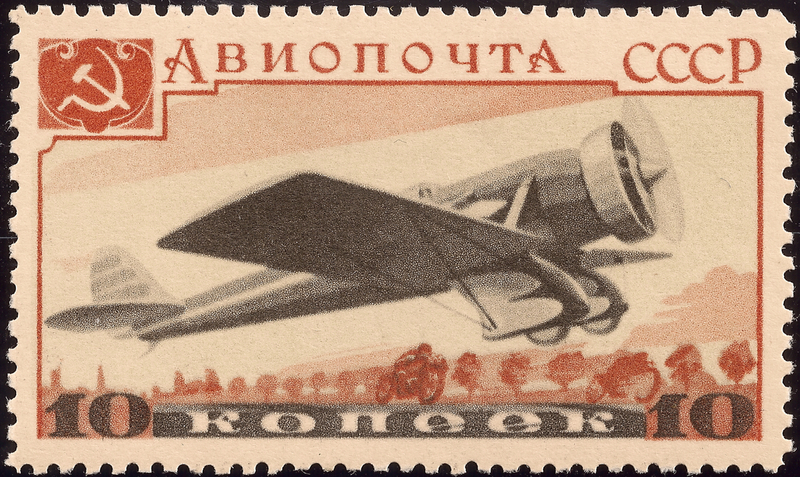 The inscription on the stamp reads: “Flight Moscow-Far East” (Перелет Москва-Дальний Восток). Non-Stop Record Flight from Moscow to the Far East. 1939, Mar.. USSR. Scott#720. Private American Collection.